Elvis Is Still Alive !!! This is the TRUTH and it's Documented ! It is FACT! That was NOT Elvis in that casket! It was a Wax Dummy ! That is exactly what was in the 900 lb Copper Casket along with a portable cooling unit to keep the Wax body from melting. Everyone that observed the '' body '' in the coffin noticed that the forehead had '' beads of moisture '' Gene Smith, Elvis's 1st cousin, said that the Sideburns had been ''glued on'' and kept coming loose ! Gene also stated that everyone could feel the ''chilled air'' all around the casket that was coming from the AC unit within the coffin. When Gene asked Vernon where Elvis was , Vernon replied , '' He's safe, Don't worry. He's Upstairs .We had to put something on display for the fans ! '' ELVIS did NOT Die on August 16, 1977! ELVIS ARON PRESLEY is STILL ALIVE !!! NO ONE is actually buried there at the Meditation Garden in back of the Mansion. That's just for the Fans , the NON-Believers and the Tourists. All of Elvis' family members that have already passed on are buried somewhere else in a undisclosed un-named Private Cemetery and ELVIS IS Very Much STILL ALIVE !!! He never really stopped making his music ! He has been recording and making music all this time . He just can''t release any of his songs using his real name anymore because of EPE, Inc. . He has been using different alias ever since . The FACTS are there for ALL to Believe and Accept !!! Elvis Aron Presley is now living as aka ''Jon Burrows '' and several other various ''alias''. He staged and faked his death with the help and knowledge of Col. Tom Parker, Dr. '' Nick '' , Joe Esposito , Howard Hughes and the FBI by doing a '' Body Swap '' with a Terminal Bone Cancer patient Roscoe Scott Holloway of Germantown, TN of whom Dr. Nichopolous had located. After some minor cosmetic surgery they made Roscoe Scott Holloway look like Elvis, a ''double'' which fooled the Paramedics , the hospital personnel and most family members. Elvis, aka ''Jon Burrows '', was a U.S. Special Federal Agent that worked undercover in various '' sting operations '' against known members of the SDS Weather Underground Terrorist Group. The SDS Weather Underground Terrorist Group was responsible for numerous multiple bombings of Police Departments , Federal and State Court Houses and other public buildings during the 1960's and 1970's. Charles William ''Bill'' Ayers was the SDS Leader of the Weather Terrorist Group, along with his cohort Bernardine Rae Dohrn, and they were personal friends and Mentors to a one Barry Soetoro, aka Barack Hussein Obama and it was the SDS Weather Underground Terrorist Group that put Barry Soetoro, aka Barack Hussein Obama into Politics and made him the Socialist Thug that he is and a threat to the American way of life as we know it. 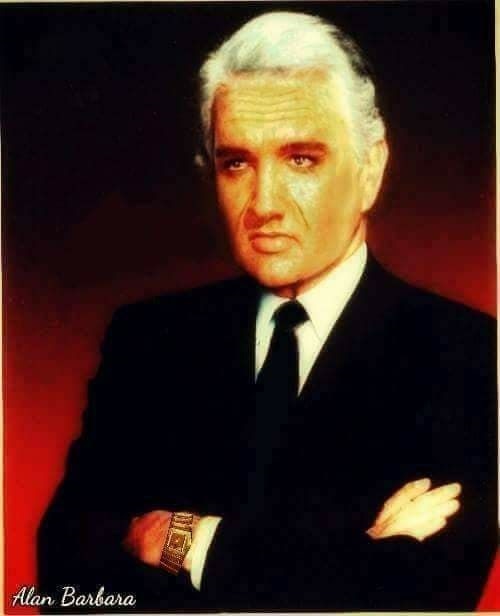 Elvis, aka Jon Burrows, the name he used when working for the DEA and later for the FBI as a Special Federal Agent, was appointed by the former late President Richard M. Nixon and Elvis, aka Jon Burrows, worked as a Federal Agent from December 1970 until his official retirement in December 2004. 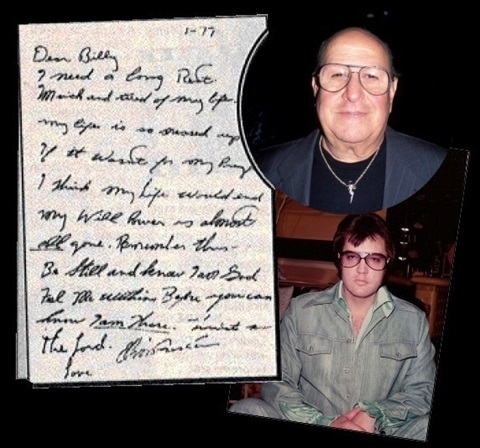 In September 1978 , Elvis, aka Federal Agent Jon Burrows, was the Government's '' Secret Witness '' in '' Operation Fountain Pen '' and He testified in Federal Court against a well known member of the Mafia Organized Crime Syndicate, a one Fredrick Peter Pro of the '' Fraternity '' . On August 16, 1977, Elvis, aka Federal Agent Jon Burrows, entered the Federal Witness Protection program where he stayed until July 1978. Then Agent Jon Burrows, aka Elvis, returned to Washington D.C. where he worked for the DEA and the FBI Counter-Intelligence Branch until his official Retirement in December 2004, and ending 34 years of dedicated Federal Service. Elvis, aka Jon Burrows is currently in the Federal Witness Protection program because of past threats made by members of the SDS Weather Underground Terrorist Group, Bill Ayers and past threats by certain key members of the Mafia Organized Crime Syndicate, of which Agent Burrows, aka Elvis took part in various undercover '' sting operations '' to indict and bring them to Justice. He is being kept in the Federal Witness Protection Program by the U.S Government DOJ ! All these facts are told in a documentary interview that Elvis / aka Jon Burrows, gave, recorded and released on a DVD in January 2012. Elvis, aka Jon Burrows, also recorded and released a brand new CD of 15 songs in January of 2012. Both have been voice authenticated 100 % as the voice of Elvis Aron Presley. Elvis was a Bonded Certified & Trained Deputy Sheriff with the Shelby County Sheriff's Dept. in Memphis,Tn, a Reserve Police Captain in the Memphis PD , a Reserve Police Captain with Denver PD and a Reserve Deputy Sheriff with the LA County Sheriff's Dept. He was nominated as One of the Top 10 Young Men in America by the American Jaycees on January 16, 1971 , not for his work as a Entertainer, but for his dedication and work in Law Enforcement ! A Georgia Fulton County Deputy Sheriff was on location at a Underground Wax Museum in Atlanta, Georgia during the week it was closing around the first of the month of August 1977. Vernon Presley, and a couple of the guys that worked for Elvis, came in and bought a life size wax figure of Elvis, because it was being auctioned off. They made the purchase and on the way out the door, after they loaded the truck, Vernon Presley turned to the Guy at the Museum counter and said, " Wait 'til you guys see what we're going to do with this." All the facts are told in a documentary interview that Elvis / aka Jon Burrows, gave, recorded and released on a DVD in January 2012. Elvis, aka Jon Burrows, also recorded and released a brand new CD of 15 songs in January of 2012. Both have been voice authenticated 100 % as the voice of Elvis Aron Presley by Computer Voice Print Analysis Technicians ! This is the TRUTH and it's Documented ! It is FACT! That was NOT Elvis in that casket! It was a Wax Dummy ! Wax Dummies DON'T have DNA ! That is exactly what was in the 900 lb Copper Casket along with a portable AC unit to keep the Wax Head from melting. Everyone that observed the '' body '' in the coffin noticed that the forehead had '' beads of sweat '' ! Gene Smith, Elvis's 1st cousin, said that the Sideburns had been ''glued on'' and kept coming loose ! Gene also stated that everyone could feel the ''chilled air'' all around the casket that was coming from the AC unit within the coffin. When Gene asked Vernon where Elvis was , Vernon replied , '' He's safe, Don't worry. He's Upstairs .We had to put something on display for the fans ! '' ELVIS did NOT Die on August 16, 1977! ELVIS ARON PRESLEY is STILL ALIVE !!! NO ONE is actually buried there at the Meditation Garden in back of the Mansion. That's just for the Fans , ( the NON-Believers ) and the Tourists. All of Elvis' family members that have passed on are buried somewhere else in a Private Cemetery and ELVIS IS Very Much STILL ALIVE !!! He never really stopped making his music ! He has been recording and making music all this time . He just can''t release any of his songs using his real name anymore because of EPE, Inc. . He has been using different alias ever since . The FACTS are there for ALL to Believe and Accept !!! Elvis Aron Presley is now living as ''Jon Burrows '' and several other various ''alias''. He staged and faked his death with the help and knowledge of Col. Tom Parker, Dr. '' Nick '' , Joe Esposito , and the FBI by doing a '' Body Swap '' with a Terminal Bone Cancer patient Roscoe Scott Holloway of Germantown, TN of whom Dr. Nichopolous had located. After some minor cosmetic surgery they made Roscoe Scott Holloway look like Elvis, a ''double'' which fooled the Paramedics , the hospital personnel and most family members. Elvis, aka ''Jon Burrows '', was a U.S. Special Federal Agent that worked undercover in various '' sting operations '' against known members of the SDS Weather Underground Terrorist Group. The SDS Weather Underground Terrorist Group was responsible for numerous multiple bombings of Police Departments , Federal and State Court Houses and other public buildings during the 1960's and 1970's. Charles William ''Bill'' Ayers was the SDS Leader of the Weather Terrorist Group, along with his cohort Bernardine Rae Dohrn, was a personal friend and Mentor to a one Barry Soetoro, aka Barack Hussein Obama and it was the SDS Weather Underground Terrorist Group that put Barry Soetoro, aka Barack Hussein Obama into Politics and made him the Socialist Thug that he is and a threat to the American way of life as we know it. 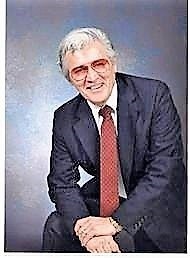 Elvis, aka Jon Burrows, the name he used when working for the DEA and later for the FBI as a Special Federal Agent, was appointed by the former late President Richard M. Nixon and Elvis, aka Jon Burrows, worked as a Federal Agent from December 1970 until his official retirement in December 2004. In September 1978 , Elvis, aka Federal Agent Jon Burrows, was the Government's '' Secret Witness '' in '' Operation Fountain Pen '' and He testified in Federal Court against a well known member of the Mafia Organized Crime Syndicate, a one Fredrick Peter Pro of the '' Fraternity '' On August 16, 1977, Elvis, aka Federal Agent Jon Burrows, entered the Federal Witness Protection program where he stayed until July 1978. Then Agent Jon Burrows, aka Elvis, returned to Washington D.C. where he worked for the DEA and the FBI Counter-Intelligence Branch until his official Retirement in December 2004, and ending 34 years of dedicated Federal Service. Elvis, aka Jesse / Jon Burrows is currently in the Federal Witness Protection program because of past threats made by members of the SDS Weather Underground Terrorist Group, Bill Ayers and past threats by certain key members of the Mafia Organized Crime Syndicate, of which Agent Burrows, aka Elvis took part in various undercover '' sting operations '' to indict and bring them to Justice. He is being kept in the Federal Witness Protection Program by the U.S Government because he knows certain facts about the Government mainly the Obama Administration that they don’t want him revealing. All these facts are told in a documentary interview that Elvis aka Jon Burrows, gave, recorded and released on a DVD in January 2012. Elvis, aka Jon Burrows, also recorded and released a brand new CD of 15 songs in January of 2012. Both have been voice authenticated 100 % as the voice of Elvis Aron Presley. Elvis was a Bonded Certified & Trained Deputy Sheriff with the Shelby County Sheriff's Dept. in Memphis,Tn, a Reserve Police Captain in the Memphis PD , a Reserve Police Captain with Denver PD and a Reserve Deputy Sheriff with the LA County Sheriff's Dept. He was nominated as One of the Top 10 Young Men in America by the American Jaycees on January 16, 1971 , not for his work as a Entertainer, but for his dedication and work in Law Enforcement ! A Georgia Fulton County Deputy Sheriff was on location at a Underground Wax Museum in Atlanta, Georgia during the week it was closing around the first of the month of August 1977. Vernon Presley, and a couple of the guys that worked for Elvis, came in and bought a life size wax figure of Elvis, because it was being auctioned off. They made the purchase and on the way out the door, after they loaded the truck, Vernon Presley turned to the Guy at the Museum and said " Wait 'til you guys see what we're going to do with this." All the facts are told in a documentary interview that Elvis aka Jon Burrows, gave, recorded and released on a DVD in January 2012. Elvis, aka Jon Burrows, also recorded and released a brand new CD of 15 songs in January of 2012. Both have been voice authenticated 100 % as the voice of Elvis Aron Presley. 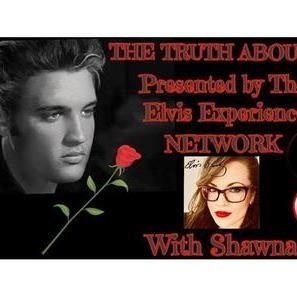 HERALDING THE ONLY RADIO SHOW TO TELL THE TRUTH ABOUT THE LIFE AND TIMES OF ELVIS ARON PRESLEY BEFORE AND AFTER 1977. ARE YOU THAT # 1 ELVIS FAN ? JOIN US ON OUR FACEBOOK GROUPS .....TCB 2018 ....and ELVIS FANS 4 LIFE -TCB . It is not the purpose of this site to state that ELVIS PRESLEY hoaxed his death and may still be alive. This is left up to each individual to decide for themselves what happened on 16th August ,1977. The facts are just presented for your consideration. I'd like to address a few things. A person becoming a federal agent and then faking his death is a pretty huge conspiracy. One conspiracy in a family is extremely rare and the odds are astronomical. 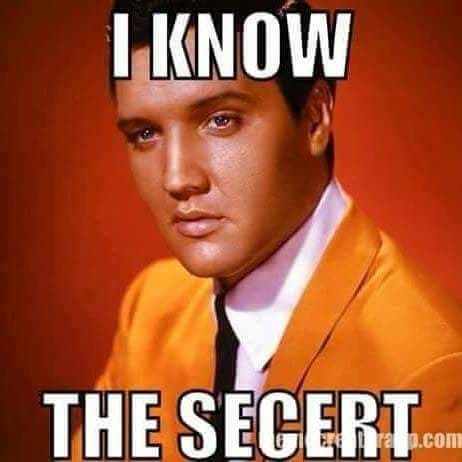 Somehow from 1988 to 2017 we have Elvis involved in so many conspiracies that it's becoming impossible to ever get to the truth. Here is some of the stuff I've been hearing lately: Elvis is preaching in front of a congregation at his own church and allowing footage to be put on youtube, Elvis is hanging out on Paltalk and "hinting" that he's Elvis, Elvis has many Facebook accounts and tells various people that he is Elvis, Elvis is riding around on a lawn mower allowing his picture to be taken, Priscilla died years ago and the woman we see now is a double, Jesse is still alive, Elvis has a 2nd and 3rd brother, Lisa Marie is not Lisa Marie, Elvis is working as a groundskeeper at Graceland and purposely being seen on camera. Preaching in front of the world, , allowing yourself to be photographed, admitting who you are, trying to sound like Elvis, etc.....None of these are good ways to hide. We have gone from a conspiracy that is hard for people to believe but is possible to the impossible. One of those things may be true. All of them cannot be. One lady told me that she is married to Elvis. Now let me give you my opinion of what we should do. So far we have found it impossible to prove any one of these stories. The next logical step is to use the process of elimination. We need to start weeding out this mess by disproving as many as possible. "Once you eliminate the impossible, whatever remains, no matter how improbable, must be the truth." -- Arthur C. Doyle. I think we have been working on this from the wrong angle and too many have become as gullible as Linda Hood Sigmon. Always, always, always ask for proof. If they can't provide any then don't believe them. It's okay to investigate their story but don't take their word for it. 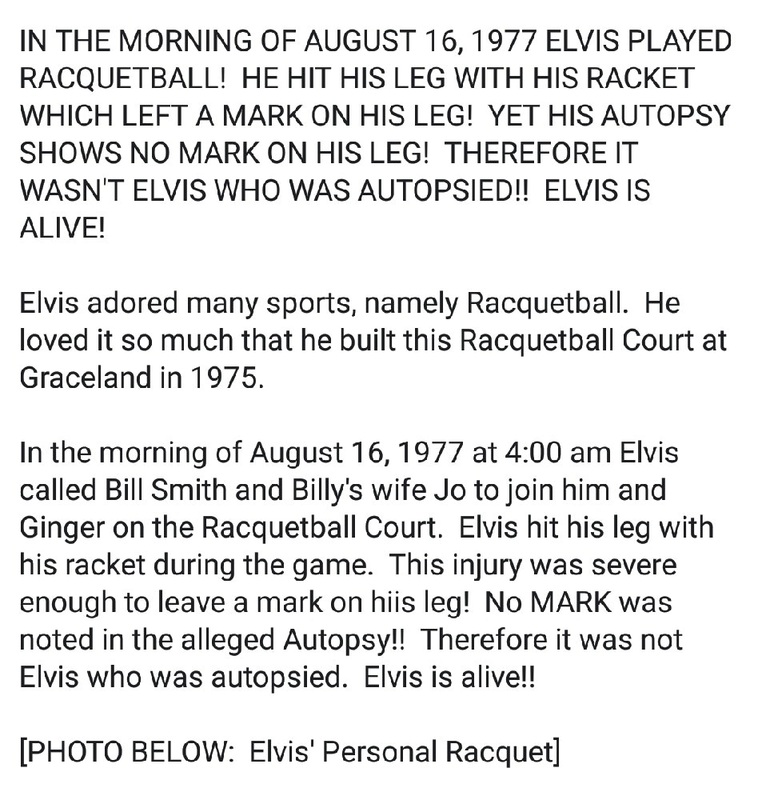 Just for the sake of the argument, if there are people, thinking, Elvis died in August 16, 1977, Memphis, TN., they should consider the alternative(s). 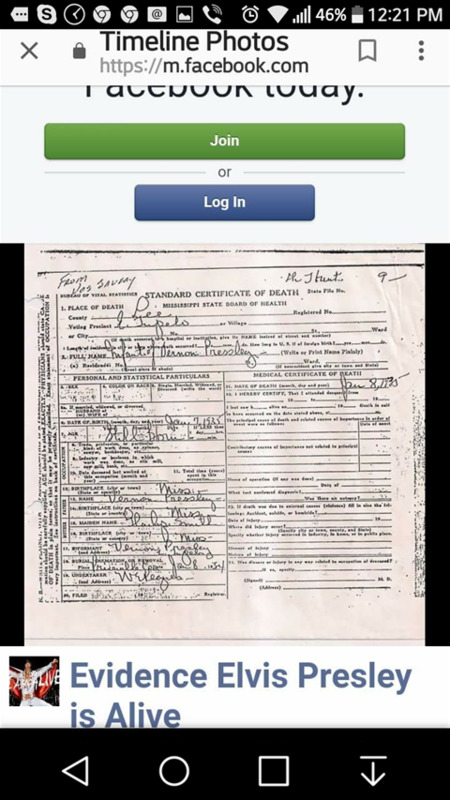 WHERE DID THE ORIGINAL DEATH CERTIFICATE GO? WHY WAS A SECOND DEATH CERTIFICATE ISSUED 2 MONTHS AFTER HIS ALLEGED DEATH? WEIRD ISN'T IT!! Elvis weighed 250 pounds at the time of his death, yet his death certificate lists him as weighing 170 pounds. The original death certificate disappeared, and the current death certificate is dated two months after his alleged death. I understand if it was a misprint, why didn’t the family change it if it was incorrect? And why did it go missing? How could you possibly lose a death certificate? It's believed there was no “original” certificate until people started to get suspicious about the circumstances surrounding Elvis’ death. Interesting isn't it? "This was the private property of the Presley family. Also, this is not the official death certificate, which, under Tennessee law will be kept private for 50 years after Elvis' death and will therefore be made public in 2027." I don't know about you, but I think something is amiss here!!! 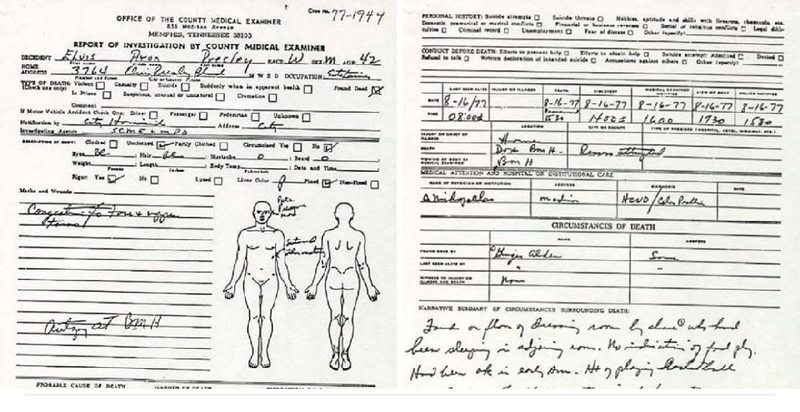 Then when you go to look at the "Medical Examiner's Report" it has been verified by handwriting analysis specialist as being in the handwriting of Elvis'. Interesting isn't it? 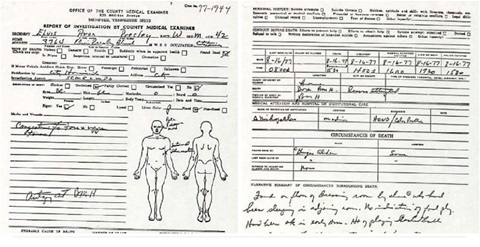 Elvis filled out his own "Medical Examiner's Report" and note that he put the spelling of "Aron" on it (see it in the picture below)!! Elvis is indeed alive!!! 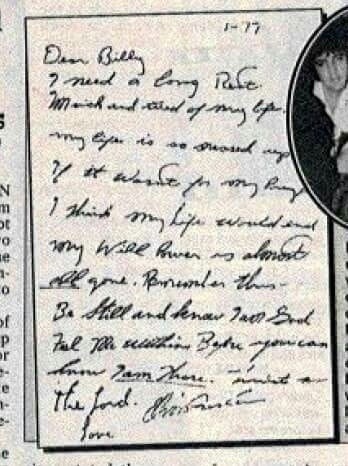 That letter January '77 does appear to be his handwriting, yes. And here's the thing. That letter itself does not mention suicide. It says he is sick and tired of his life, that he needs a long rest. This is not the only reported instance that Elvis told people around that time that he was tired of his life and wanted to be free of the obligations and personal pain that was killing him from the inside and out. He even spoke of switching places with a lookalike. He wanted out of that life, we all know that. And he got out of that life. He killed off Elvis Presley. So yes, if you want to be technical, Elvis Presley killed himself off on 8-16-1977 - but it was NOT a suicide. He killed off the persona of Elvis Presley, and became someone else. As for Joe finding a suicide letter, he apparently burned it. If so, that's convenient. Again, Elvis ''killed off'' Elvis. And there was a real dead body that was used (duh!). I can understand how finding a dead body in Elvis' pyjamas with pills all around him would look - and as messed up as that sounds, that was the whole idea. Elvis knew he was in a bad way and he played on that. He knew what way he would die if he did die, and he took advantage of that scenario. It all went to plan. A body seemingly him was found, was taken to hospital, pronounced dead, autopsied upon, embalmed and buried. But it was somebody else's body. The man we all knew and loved as Elvis was still very much alive. He and his contacts who helped had pulled off the greatest hoax in the history of show business. And because of this, finally, the man found peace. 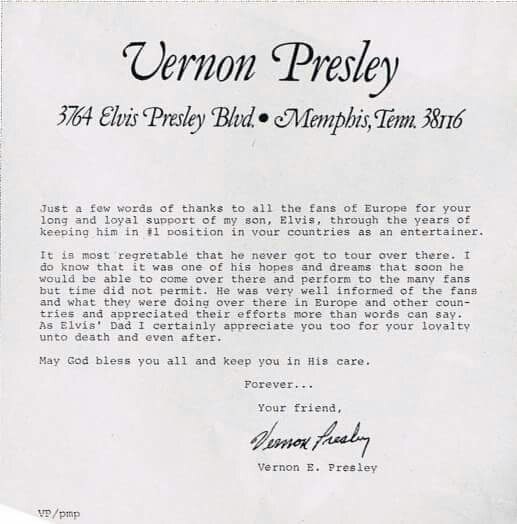 N THIS UNDATED LETTER BY VERNON PRESLEY, HE CONFIRMS THAT IT WAS ELVIS' WISHED TO PERFORM IN EUROPE BUT HE NEVER GOT TO!! 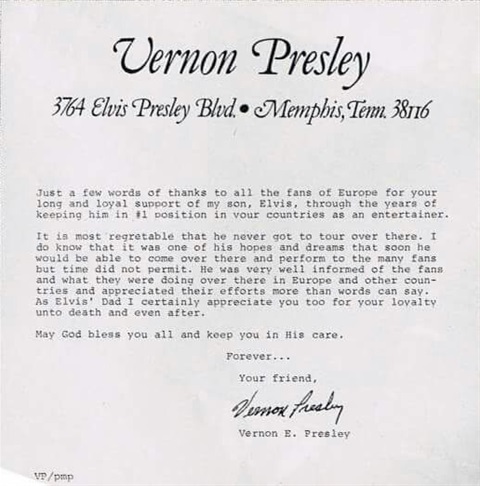 I found this undated letter written by Vernon Presley to all fans of Europe for their support of Elvis. In this letter Vernon states that Elvis never got to tour in Europe, even though it was one of his hopes and dreams to perform in Europe. Touring Europe would of been great but it was not to be (as we know that the Colonel could not go to Europe as he was wanted for murder which was unknown to Elvis at that time)! Let me try something, people have been asking me about how I met Elvis let me share I was doing a show in Memphis I'm a country singer song writer actress model and now a Dolly Parton tribute Artist. His uncle Vester came to one of my shows he liked me and asked me if I would like to meet his nephew. That lasted for about a year then something wonderful happened. He asked me if I wanted to be his girlfriend. Elvis had given all of us names mine was angel. Let me get back to my story Elvis came up to me to kiss me I kissed him but he pulled away. He said angel let me teach you how to kiss me the way I want to be kissed. I said OK so he taught me how to kiss. Then as the time went on I too was an entertainer so I was one of the best kept secret'sGene Mason helped protect me let me say one thing I found love with a man not the image. I feel so wow overwhelmed he told me that was his favorite number. But I did I told him I didn't want anything like that because I love him for who he was and not for what he could give me. He seemed disappointed but then he smiled. And said angel I love you. He had me protected very well. I never had to pack a suitcase he always had clothes for me in the closet he would pick the ones out that he wanted me to wear. Even though I knew whenever I would leave someone else would come take my place. I was just one of them. But I like to think I was special. We were out in the garden Elvis was crying he was very upset about a book that somebody wrote about him somebody he really thought he could trust he was very concerned because there was a lot of lies saying it's his thing was he didn't want Lisa Marie to grow up and read it and believe it. I put my arms around him and held him as he cried. Then he said to me angel promise me you will never write a book about our personal personal life I made a promise to him and I have never never went back on my promise. I have been offered money that I said no. He also told me he was cleaning house that day he was getting rid of a lot of people he told me that if it wasn't for the fact of who he was they wouldn't have anything to do with him that he was there banker and a chick magnet. I said E are you getting rid of me too. He said Angel I would never get rid of you. Then he pulled out a box with beautiful pearls in it as it was my birthday and put them around my neck. As I found out these pearls were once his mothers his mothers favorite jewelry was pearls that he had gotten her now I have them. And I said yes your eyes your eyes will never change. I received a phone call on 17 August from Vernon Elvis's dad telling me that Elvis had passed away. And it was best that I not show up. Unto a week or so later. When I got back there was lots of people all around crying people at the gate a lot of young people as well as older ones. The body he did not look like him the nose the thing I really noticed was his hands because it was his hands were all broken up from the karate and the hands on this person were not broken up. As we left I just couldn't believe what I was seeing there was a young woman there that I had seen years ago when she was dating David Stanley is her name with Sandy now it's sandy Milburn it was so funny as Elvis and I were coming in from the poolhouse she was up on the counter stealing Elvis candy , his candy was Butterfingers that's when he gave her the name Sandy Candy. I was scared to dieath , thought she was going to fall. At his funeral she was there and she looked like a little scared rabbit she didn't know what to do sitting there looking at a casket. I would go there and I would sing and talk about Elvis. Or to break my promise. Getting ready to do my part. This gentleman said to me he sounds so good. I said yes he did then he started singing to with this kid. I said to him you to have a very good voice. This man was dressed in a nice pair of dark colored slacks and a nice blue shirt and a sports jacket. I guess he weighed probably 170 pounds. He had white hair very nicely combs very thin looking beard. I said do you remember me he said Angel it's been a long time. God bless you I love you and I love you Mr. Elvis Aron Presley. One thing I forgot my house was broken into about 1985 everything I had on my pictures everything he's given me except my TLC and my pearls were taken from my house all our pictures the letters that he wrote me everything was taken. I had my TLC on my neck which I never take off and I had my pearls in a certain place that nobody knew they were there this was done while I was on tour. Every word she wrote is true. I was prevented from writing this by powerful people.Thanks Angel!. Jenny Moulton This is beautiful and tells about this man's heart..... special, special man. What a privilege you had in your time with him, and so glad you get to talk to him now. HOW MUCH MORE CAN EPE ROB THE FANS ? it is what it is, now to show u who he is today it time for the smoke to fade for the truth to come out and show Elvis as a young 83 year old man with silver hair , any way , the 80' is the new 50' in this day and time & with all honesty who he was 40 years ago is not who he is today. One of Elvis's very favorite books was/is "Cheiro’s Book of Numbers". It is very fascinating reading material...Anyone who has not believed that Elvis “faked” his death on August 16, 1977, needs to rethink their doubts. Remember that August 16, 1977 = August is 8, 16th is 2 x 8, and 1977 equals 24 which is 3 x 8. Look into the presence of his #8 in the date 8-16-1977. Of course, the month of August being the 8th month is obvious to everyone…but look farther at the #8…first of all we have 1×8, 2×8, 3×8 which equals 8, 16, and 24. So, there we have the three multiplications of 8 (888) as well as 8+8+8 = 24. So this alone was an amazing date for Elvis. Then coupled with the fact that the year 1977 equals 24. Cheiro’s Book of Numbers it is explaining the meaning of 24 and 42. 42 (Elvis’ age), it is simply the reverse of 24 and has the same meaning as the 24 (see the "Cheiro’s Book of Numbers"). ELVIS PHONE CALL AFTER 1977.
WHO IS JESS FULTON? YOU DECIDE! 1. Elvis’ name is misspelled on his tombstone. Elvis’ full name is Elvis ‘Aron’ Presley…, not Elvis ‘Aaron’ Presley. His father would not have let this happen. When Elvis was born, his name was misspelled on his birth certificate and his father went to great lengths to get the error corrected. The spelling of Elvis’ name was very important to the Presley family. They wanted Elvis to see that Aron was part of Garon (Garon is the middle name of Elvis’ twin brother that was stillborn). Why the misspelling on the tombstone? Some say it is because Elvis did not want to tempt fate. 2. Elvis’ current resting place is in between his father and his grandmother and not next to his mother where he had adamantly requested. It is doubtful that the people close to him would allow these things to happen. Elvis is a superstitious man – enough so that he wouldn’t tempt fate by putting his real name on a tombstone, or violate the ground next to his mother until he was ready to be placed there for good. 3. Elvis was very vain, and he was embarrassed about his recent weight gain – An astonishing 50 pounds in the month before his so-called death. Even though he weighed 250 pounds at the time of his death, his death certificate lists him at a spry 170 pounds. The original death certificate disappeared, and the current death certificate is dated two months after his alleged death. 5. And why have the funeral so quickly? Some speculate that the immediacy was intended to make it as difficult as possible for the people who were Elvis’ biggest fans (heads of fan clubs, etc.) to attend the proceedings. It could be a concern that they might recognize the flaws in the wax replica…, many of which were noticed anyway. 7. Two hours after Elvis’ death was announced publicly, a man who reportedly looked remarkably like Elvis purchased a ticket for Buenos Aeries, paid in cash, and used the name John Burrows: the name Elvis had used as an alias several times before. 8. He had a few books that were considered to be his most prized possessions. He had a Bible, several pharmaceutical books, books on death, and most importantly Cheiro’s Book of Numbers and the Autobiography of a Yogi. After his death was announced, these books disappeared and were never recovered. Also missing were specific pieces of jewelry and pictures of his mother. 9. In the weeks preceding his alleged death, Elvis’ actions were not those of a man who was about to embark on an extensive US tour. He ordered no new suits despite having gained 50 pounds since his last tour. 11. Two days before his alleged death, Elvis telephoned a friend of his named Miss Foster (Elvis had been friends with her for a long time because she reminded him of his mother). He told her that he wasn’t planning on going on the upcoming tour. She asked him if he had canceled it, and he said that he had not. When she asked if he was ill, he said that he was fine, and that she should not ask any more questions or tell anyone anything, and that she should not believe anything she reads. He told her that his troubles would all soon be over, and that he would call her in a few weeks. The author of ‘Elvis Where Are You?’ writes that Miss Foster took a polygraph test regarding this story, and that she was not lying. 12. The day after Elvis’ alleged death, a woman named Lucy De Barbon, a former lover of Elvis’, received a single rose in the mail. The card indicated that the flower was from “El Lancelot”. This had been her pet name for Elvis, and it was a name that no one else knew. 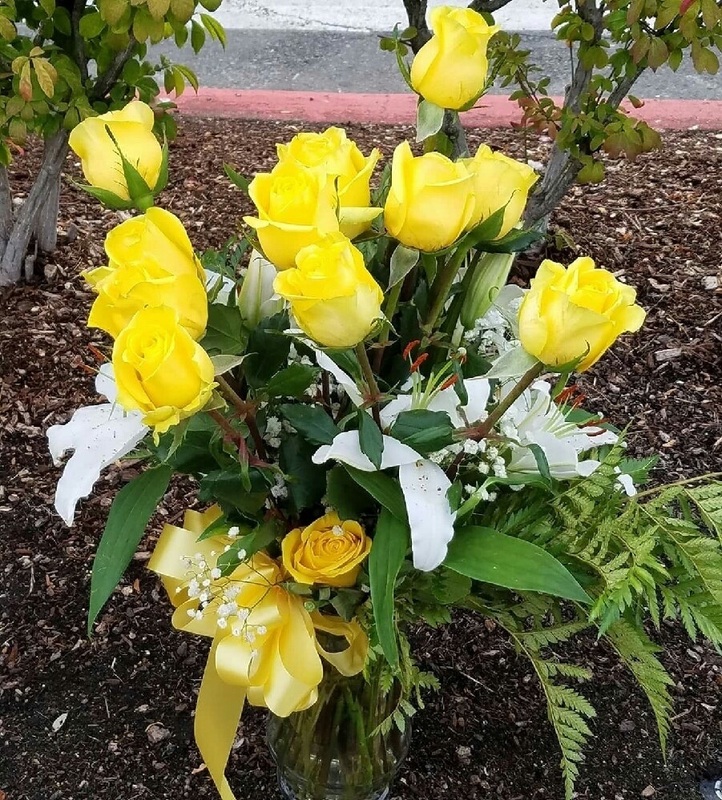 Flowers can’t be sent from beyond the grave. 13. 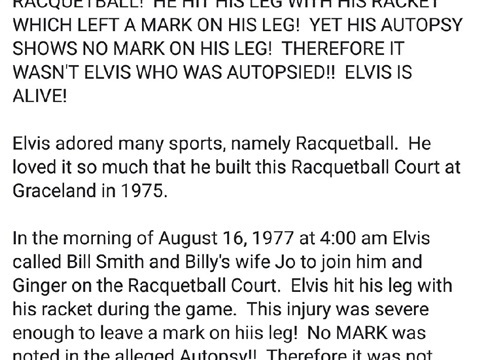 Elvis had many reasons to fake his death. Elvis’ life was in danger. He had recently lost $1,300,000 in an airplane/real estate deal with a California based organization called the “Fraternity” that had links to the Mafia. It is speculated that he corroborated with the government to expose the organized crime ring in exchange for protection – perhaps in the form of a new life and identity compliments of the witness relocation program. 14. Elvis was a prisoner of his own fame. He had many other reasons to leave his life behind. Because of his incredible popularity, he was the recipient of several death threats, and he was concerned about the safety of his ex-wife and daughter. Sometimes when he wanted to leave Graceland, he would send out look-alikes to distract would be followers. Elvis was also known to ride in the trunk of someone else’s car to avoid detection. 15. Elvis had the means to fake his own death. He is accused of destroying himself with drugs. In reality, Elvis was a pharmaceutical expert. He took a lot of drugs, but he knew what he was doing and was extremely careful. He knew what drugs he could self- administer to create a deathlike state. Further, Elvis’ experience with the martial arts was such that he could slow his heart rate and breathing in order to feign death. He was an eighth degree black belt. 16. Elvis’ manager, Colonel Tom Parker, had once created a new identity for himself. He came to this country as an illegal immigrant from Holland, but through various connections managed to create an elaborate identity complete with a passport, birth certificate, drivers’ license, and social security number. He would have known how to give Elvis a second life. 17. Elvis’ Lloyds of London life insurance policy still has not been cashed in. Why? It is not illegal to fake your death as long as you don’t profit from it. 18. There was a helicopter hovering over Graceland just moments before Elvis was found dead. Did Elvis get on that helicopter? Did the helicopter drop off another body to take Elvis’ place? Monte Nicholson, a veteran with the Los Angeles Sheriff’s Dept., writes in his novel The Presley Arrangement about a government helicopter hovering over Graceland, and finally landing in the back. Nicholson was informed there were pictures of Elvis getting on the helicopter during the early afternoon of August 16. Others report seeing a helicopter – including Larry Geller in his book If I Can Dream: Elvis’ Own Story, who says he saw from his window at Howard Johnson’s: helicopters hovering over Graceland. 19. According to handwriting experts, Elvis’ own handwriting was on his death certificate/coroners report. 20. Some of Elvis’ closest friends were asked, by Vernon, not to attend the funeral. 21. Elvis’ father refused to have his son’s coffin draped with the American flag, traditionally given to all dead veterans. Did he know that the coffin did not contain his son’s body? 22. In December 1970, Elvis was inducted into the Drug Enforcement Agency (DEA) by President Nixon. Elvis had just been awarded one of America’s Ten Outstanding Young Men for his efforts to wipe out drugs. Elvis went undercover for the DEA and helped put one of America’s largest crime rings behind bars. This particular undercover operation was coded ‘Operation Fountain Pen’. Was Elvis really addicted to drugs…, or was he the ultimate actor after all? The U.S. Department of Justice’s Federal Bureau of Investigation in Washington confirmed in a letter to Maria Columbus, president of The Elvis Special fan club, that Presley visited FBI headquarters on December 31, 1970 and was given a tour of FBI facilities. Two months prior to meeting with President Nixon, Elvis was presented with a CNOA Membership Certificate that reads: This is to certify that Elvis A. Presley is a member in good standing of the California Narcotics Officers Association. Once when Elvis was on stage, he wanted to prove to the audience that he was not strung out on drugs like everyone said he was. He then displayed a certificate to the audience and said, “This if from the International Narcotics Enforcement Association. This Certificate gives me special honors and a lifelong membership. I’ve been wearing a federal narcotics badge for six years. They don’t give you that if you’re strung out.” One of the fan letters states that several police uniforms were delivered to Graceland on August 15, 1977. 24. 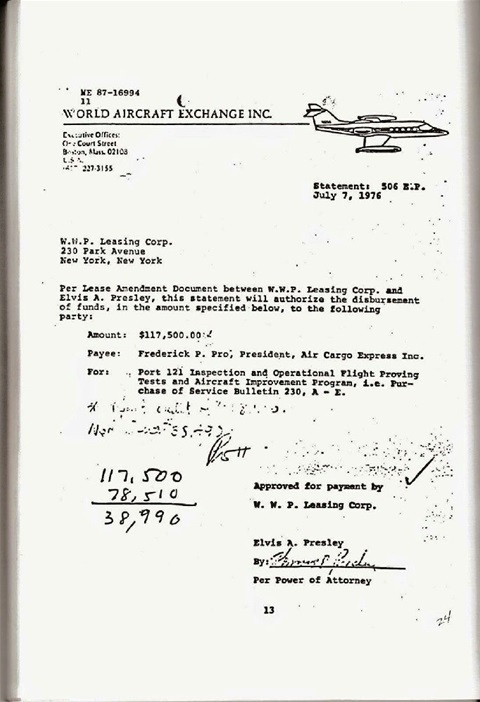 One month prior to August 1977…, $1,000,000.00 was withdrawn from his personal checking account. 25. The medical examiner’s report says that the body was found in the bathroom in a rigor-mortised condition. The homicide report says that the body was found in the bedroom ‘unconscious’. 26. What about the tape – authenticated – that was sent to a top voice-identification expert, on which Elvis talked about things that did not occur before August 1977? 27. 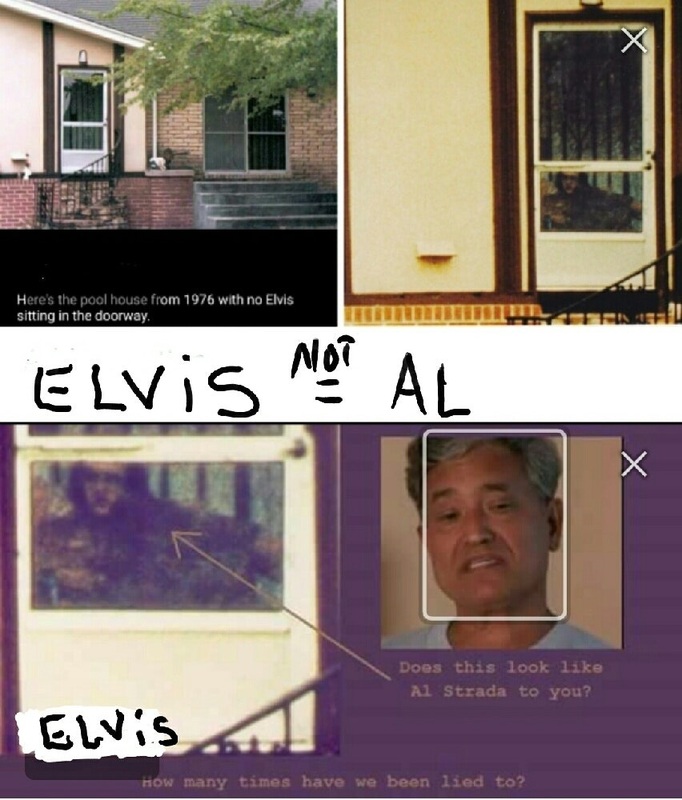 What about the mind-boggling picture taken in the poolhouse behind Graceland’s Meditation Gardens four months after the death of Presley and showing a man seated who looked exactly like Elvis? Mike Joseph took this photograph in January 1978 while on vacation and visiting Meditation Gardens. There is an audio recording of Mike Joseph stating that the person in that photograph is Elvis. Later, after a meeting with Joe Esposito and Al Strada, he changed his story. Now he says that he never stated that it was Elvis in the photograph even though he was recorded as saying it was. 29. “If I should return you would not recognize me” is underlined in one of Elvis’ favorite books. 30. In ‘Elvis, My Brother’, Billy Stanley noted that Elvis was wearing a jogging suit with the DEA logo during the early morning hours of August 16, 1977. 32. Phone records show that Ginger Alden, Elvis’ girlfriend at the time of his alleged death, phoned the National Enquirer one to three hours before calling downstairs for help when she found Elvis in the bathroom floor. How did she know to call them one to three hours before there was anything to call about? Did she know that there was going to be a body in there later in the day? 34. Elvis believed that he was chosen by God for something special. He thought he had special powers like, hands-on-healing. I think he may have had some special gifts other than his voice. Elvis was always studying about religion. He didn’t want to take any chances when it came to getting into the Kingdom of Heaven. One of his favorite books, which you will find on display at Graceland now, was The Passover Plot by Hugh Schonfield in 1966. The book is a story of how Jesus may have faked his death and came back 16 years later instead of being resurrected. Elvis may have faked his death and given up all worldly possessions in an effort to make it into the Kingdom of Heaven. Elvis once mentioned to a friend that he would like to become a Monk. After August 16, 1977, a man dressed as a Monk went into a popular entertainment club. Another customer reported that the face under the hood looked remarkably like Elvis Presley. As it turns out, the club was owned by a good friend of Elvis’. 35. There were orders by the Presley Estate that no cameras be brought to the funeral. However, one of Elvis’ relatives, Bobby Mann, managed to sneak one in. The picture he took appeared on the front of the National Enquirer. It is evident in the picture that it is not Elvis Presley. 37. Dee Presley, Elvis’ stepmother, said she received a call from someone sounding like Elvis, saying things only Elvis knew. 38. A picture taken September 23, 1984 shows Muhammad Ali, Reverend Jesse Jackson, and what appears to be Elvis Presley. When Muhammad Ali was in Fort Worth, Texas, toward the end of 1989, promoting his cologne, two people showed him the picture. As reported by the Fort Worth Star-Telegram, Ali identified the man in the picture with him as “My friend Elvis.” Also, in late 1989, a lady showed the picture to Elvis’ step-brother, Billy Stanley. Billy pointed the man out as being Elvis Presley. He said he wanted a copy of the picture to put on his office wall to prove that Elvis was not a racist. 39. Priscilla made wildly contradictory statements about where she was on the night of Elvis’ death. Elvis’ road manager let it slip that he was worried about Priscilla and daughter Lisa Marie at Graceland after Elvis’ death — a time period when Priscilla was SUPPOSED to be in Los Angeles. 40. Joe Esposito said, on the Geraldo show June 18, 1990, “In the first place, how can he commit suicide? He’s living in Kalamazoo, Michigan.” watch it on you tube. BOTH PARAMEDICS CLAIMED THAT IT WAS NOT ELVIS AT THE DEATH SCENE! THEREFORE IF IT WAS NOT ELVIS AT THE DEATH SCENE, AN "ELVIS DOUBLE" DIED IN HIS PLACE! I read this Phil Aitcheson interview whereby he states that both Ambulance Attendants at the death scene whose names were "Charlie Crosby" and "Ulysses Jones" claimed that it was not Elvis at the death scene (Ulysses was friends with Elvis and said that it was not Elvis). Later on Charlie Crosby was murdered (he was pushed out of an airplane) for running his mouth. Therefore if it was not Elvis at the death scene, an "Elvis double" died in his place. If Elvis used a "double" in his place (then it is obvious that he had preplanned to fake his death in advance ... some say as early as 1974). Read Phil Aitcheson's interview below about both Ambulance Drivers (by the way Ulysses Jones also passed away). Q - I find Ginger Alden's actions on the day of August 16th, 1977 to be rather odd. I've read that she did not immediately call for help. A - Right. Plus she claimed to wake up in a bit of a stupor because she had taken some sort of sleeping medication and said she saw two guys carrying something heavy across the bedroom, during the course of the night. We interviewed Ulysses Jones, who was one of the former paramedics in the case, who told us in a taped telephone conversation that he knew it wasn't Elvis on the floor. He had known Elvis all his life and it didn't look like him. And, in fact he and partner Charlie Crosby, who was later killed for running his mouth. Come to find out, he met with an unfortunate accident...he was actually pushed out of an airplane, and it was murder. Q - Who were these guys? A - They were the paramedics that were called to the house that day to work on the body. They both went back to their firehouse telling their Captain and their superiors it was not Elvis. Their knees were shaking. They were scared to death. They were told not to repeat what they said. And they take the body into the hospital for this alleged autopsy that supposed to take place, but never did take place. They were supposed to have taken out stomach contents and other bodily parts that went to the Mayo Clinic for examination to determine what the cause of death could be on this particular cadaver and it came back with "MS" scrawled across the bottom of the report. 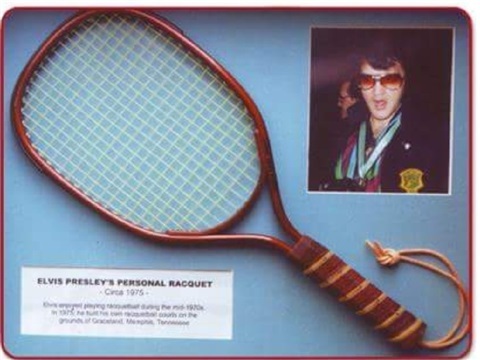 It was pictured in The Presley Report. And the fact is, Elvis never had MS.
Q - How did you hear about this paramedic, Charlie Crosby's death? A - Ulysses said he met with an unfortunate accident sometime after. Ulysses Jones is a retired State representative for the State of Tennessee. He was a paramedic at the time. He was on the team that was called to the house. There's questions about whether Vernon was there or Vernon drove up the driveway in a car and then came into the house. Some of the accounts aren't even straight on whether he rode in the ambulance with his son to the hospital or what was purportedly to be his son. There was talk about Lisa Marie riding around in golf carts at two o'clock in the morning on the evening that her daddy was supposed to have passed away. Those stories are completely inaccurate from everything we've seen. IN THIS CONVERSATION WITH "FELTON JARVIS" (WHO WAS ELVIS' RECORD PRODUCER) HE SAYS "I'M JUST SO TIRED OF BEING ELVIS PRESLEY"!! ELVIS WAS TIRED OF BEING HIMSELF & AS A RESULT FAKED HIS DEATH! Felton Jarvis was Elvis's producer for almost twenty years. He died, at age 46, in January 1981. He once told the following story to a friend of his and of Elvis'. "A year and a half before Elvis died, in February, 1976, he recorded, for the last time, enough songs for an album of completely fresh material. RCA had been unable to get him into a studio, and they had finally set up a studio in the living room at Graceland. They cut 12 songs in eight days, and though Elvis never wrote his own material, he frequently recorded songs that were indicative of his state of mind. Some of the songs recorded in those sessions were: "Hurt"; "I'll Never Fall in Love Again"; "The Bitter They Are, The Harder They Fall"; and "Solitaire", which Elvis seemed fixated on, and which tells the story of a lonely existence. He also recorded "Danny Boy," his mother's favorite song, which he had been meaning to record for a long time. On the last night, Felton Jarvis and Elvis walked outside and stood on the Graceland lawn. Elvis had said, "I'm so tired." "You need some rest," Jarvis had agreed. "That's not what I mean," Elvis had said. "I mean: I'm just so tired of being Elvis Presley." NOTICE THAT IN THE AUTOPSY POSTMORTEM REPORT NO. 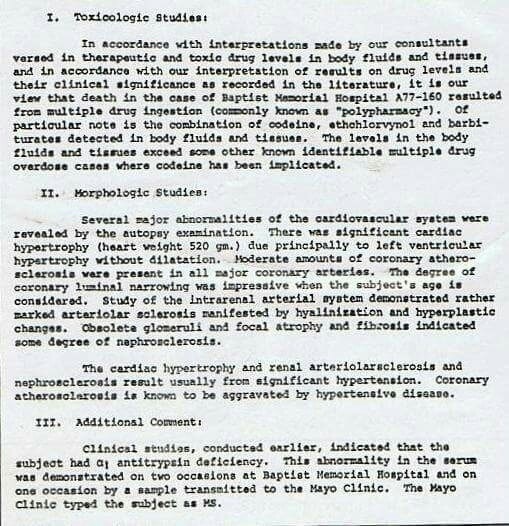 A77-160 FROM BAPTIST MEMORIAL HOSPITAL, MEMPHIS, DATED AUGUST 16, 1977 THERE ARE SEVERAL FACTORS SHOWING THAT IT WAS NOT ELVIS! FIRST OF ALL, THIS REPORT SAYS THAT THE CORPSE HAD "MS"! YET ELVIS DOES NOT HAVE "MS"! THEN IT SAYS THAT THE CORPSE HAD CODEINE AT 10 TIMES THE PRESCRIBED MANNER (BUT NOT IN LETHAL RANGE)! YET ELVIS WAS ALLERGIC TO CODEINE! SO IT COULD NOT OF BEEN ELVIS! Look at the Toxicology Report below, it says that the corpse had "MS". Yet Elvis does not have "MS"! Therefore it could not of been Elvis! Now look below at the "Table 2 Serum Drug Levels Found in Elvis Presley at Autopsy" report. Toxicology tested positive for 10 separate prescription medications but showed negative for illicit drugs and alcohol. The only alarming pharmaceutical indicator, on its own, was codeine at 10 times the prescribed manner but not in lethal range. Elvis was allergic to codeine, yet they found codeine in the corpse! Therefore it could not of been Elvis! Coupled with this toxicological data are the pathological findings and the reported history that the deceased had been mobile and functional within 8 hours prior to death. Together, all this information points to a conclusion that, whatever tolerance the deceased may have acquired to the many drugs found in his system, the strong probability is that these drugs were the major contribution to his demise. 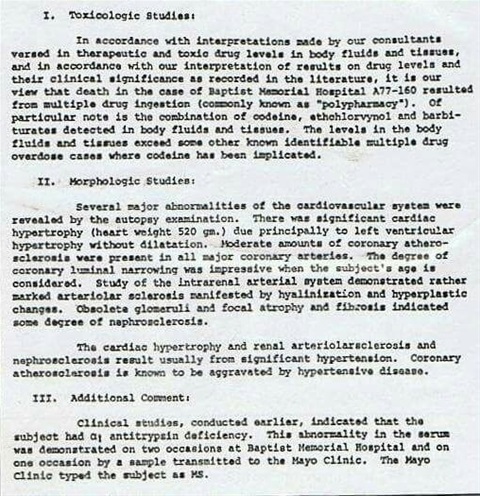 "In accordance with interpretations made by our consultants versed in therapeutic and toxic drug levels in body fluids and tissues, and in accordance with our interpretation of results on drug levels and their clinical signficance as recorded in the literature, it is our view that death in the case of Baptist Memorial Hospital A77-160 resulted from multiple drug ingestion (commonly now as "Polypharmacy"). Of particular note is the combination of codeine, ethchlorvynol and barbiturates detected in body fluids and tissues. The levels in the body fluids and tissues exceed some other known identifiiable multiple drug overdose cases where codeine has been implicated." The Tennessee Board of Health then began an investigation into Elvis’s death which resulted in proceedings against Doctor Nick. Evidence showed that during the seven and a half months preceding Elvis’s death — from January 1, 1977, to August 16, 1977 — Doctor Nick wrote prescriptions for Elvis for at least 8,805 pills, tablets, vials, and injectables. Going back to January 1975, the count was 19,012. Doctor Nick admitted to this. His defense was because Elvis was so wired on pain killers, he prescribed these medications to keep Elvis away from dangerous street drugs, thereby controlling Elvis’s addiction — addiction being a disease. One of the defense witnesses was Dr. Forest Torrent, a prominent California physician and a pioneer in the use of opiates in pain treatment who explained how the effects this level of codeine would have contributed to Elvis’s death. Central to misconduct allegations was the issue of high codeine levels in Elvis at the time of death — codeine being the prime toxicological suspect as the pharmaceutical contributor. It was established that Elvis obtained codeine pills from a dentist the day before his death and Doctor Nick had no knowledge of it. The jury bought it and Doctor Nick was absolved of negligence in directly causing Elvis Presley’s fatal event. Everyone wants to know how I meet Elvis about how I met Elvis let me share I was doing a show in Memphis I'm a country singer song writer actress model and now a Dolly Parton tribute Artist. 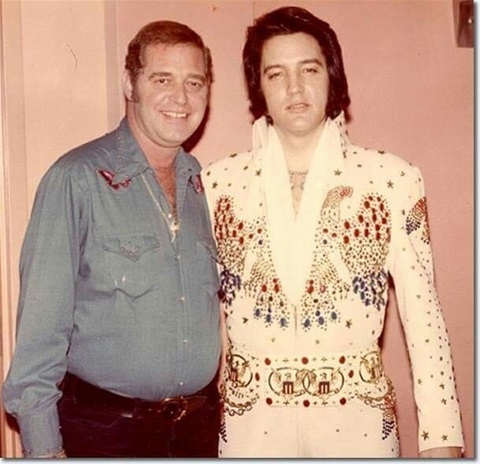 I'm met Elvis in 1974 His uncle Vester came to one of my shows he liked me and asked me if I would like to meet his nephew. I normally don't do this but I said OK then as we were driving he told me his nephew was Elvis Presley I was in total shock I had no idea anyway we pulled up to Graceland there were a lot of people we went in the front door then uncle Vester had me wait next thing I know is gorgeous wonderful man showed up . We became prayer partners Elvis Presley we hit it off right away he really seem to like me but in a different way because I started talking to him about God We became prayer partners that day That lasted for about a year then something wonderful happened. He asked me if I wanted to be his girlfriend. That was the 1975 I said wow me. He said yes Angel Elvis had given all of us names mine was angel. Let me get back to my story Elvis came up to me to kiss me I kissed him but he pulled away. He said angel let me teach you how to kiss me the way I want to be kissed. I said OK so he taught me how to kiss. Then as the time went on I too was an entertainer so I was one of the best kept secret'sGene Mason helped protect me let me say one thing I found love with a man not the image. A knew of the others did as well as uncle Vester On August 1975 Elvis came up to me in the garden he had a box in his hand and he asked me to close my eyes so I did that's when I received my TLC mine was number 13 I feel so wow overwhelmed he told me that was his favorite number. Then about three weeks later when I went back to Memphis He wanted to give me a car I believe I was the only one that ever turned down one But I did I told him I didn't want anything like that because I love him for who he was and not for what he could give me. He seemed disappointed but then he smiled. And said angel I love you. As the years went on there were times that we were together in Memphis and times in California LA and Palm Springs He had me projected very well. I never had to pack a suitcase he always had clothes for me in the closet he would pick the ones out that he wanted me to wear. I feel very special. Even though I knew whenever I would leave someone else would come take my place. As E had many girlfriends I was just one of them. But I like to think I was special. As years went on August 11 my birthday I've 1977 We were out in the garden Elvis was crying he was very upset about a book that somebody wrote about him somebody he really thought he could trust he was very concerned because there was a lot of lies saying it's his thing was he didn't want Lisa Marie to grow up and read it and believe it. I put my arms around him and held him as he cried. Then he said to me angel promise me you will never write a book about our personal personal life I made a promise to him and I have never never went back on my promise. I have been offered money that I said no. He also told me he was cleaning house that day he was getting rid of a lot of people he told me that if it wasn't for the fact of who he was they wouldn't have anything to do with him that he was there banker and a chick magnet. I said E are you getting rid of me too. He said Angel I would never get rid of you. Then he pulled out a box with beautiful pearls in it as it was my birthday and put them around my neck. As I found out these pearls were once his mothers his mothers favorite jewelry was pearls that he had gotten her now I have them. And told me that I was coming out of hiding he wanted the world to know me he asked me to go to Las Vegas at the Hilton hotel and wait for him I was going to be with him well he also said to me if I disappeared would you still know me And I said yes your eyes your eyes will never change. Then on August 13 I went back to Las Vegas at the Hilton to wait for him I received a phone call on 16 of August from Vernon Elvis's dad telling me that Elvis had passed away. And it was best that I not show up. Unto a week or so later. I caught a plane immediately back to Memphis When I got back there was lots of people all around crying people at the gate a lot of young people as well as older ones. Uncle Vester is the one that brought me close to the door As I entered the Foyer there were a lot of people for Priscilla sitting over by the dining area with her family Ginger was up on the staircase I was down on the side as I viewed The body he did not look like him the nose the thing I really noticed was his hands because it was his hands were all broken up from the karate and the hands on this person were not broken up. As I stood there and watched Gene E cousin What is your holding my hand. Vernon where's off at the side by Priscilla and Lisa I never thought it looked like him but that it just wasn't right As we left I just couldn't believe what I was seeing there was a young woman there that I had seen years ago when she was dating David Stanley is her name with Sandy now it's sandy Milburn it was so funny as Elvis and I were coming in from the poorhouse she was up on the counter stealing Elvis candy he's candy was Butterfingers that's when he gave her the name Sandy Candy. I was scared to die thought she was going to fall. At his funeral she was there and she look like a little scared rabbit she didn't know what to do sitting there looking at a casket. As years went on I would still go to the Elvis week every year I would go there and I would sing and talk about Elvis. But I never did anything to hurt him Or to break my promise. Last year I was there at the tent across from Graceland Getting ready to do my part. When right in front of the stage off to the left there was a gentleman sitting there I didn't think anything about it and asked if I could sit there he said yes There was a young boy up on the stage singing This gentleman said to me he sounds so good. I said yes he did then he started singing to with this kid. I said to him you to have a very good voice. This man was dressed in a nice pair of dark colored slacks and a nice blue shirt and a sports jacket. I guess he weighed probably 170 pounds. He had white hair very nicely combs very thin looking beard. I said to him would you do me a favor would you remove your glasses. He looked right at me and took his glasses off! His classes for regular prescription glasses and on the sides of them was EP I said oh my God and he said angel Sh sh I said do you remember me he said Angel it's been a long time. I started to cry Then they called me up to do my part I looked back where we were sitting he was gone and walking out into the parking lot. Now you can all call me a liar whatever but I believe that person was my first love E And I have been talking to him for the past year Please no negative comments no I am not crazy I know who I saw and who I speak with God bless you I love you and I love you Mr. Elvis Aron Presley. One thing I forgot my house was broken into about 1985 everything I had on my pictures everything he's given me except my TLC and my pearls were taken from my house all our pictures the letters that he wrote me everything was taken. I had my TLC on my neck which I never take off and I had my pearls in a certain place that nobody knew they were. that`s real good . I will put it on my website with your permission . I might be able to find your other story online in one of the groups . Thank you Angel . ....I made a new friend today . She`s a femalle tribute artist calling herself ELVISA LOVE . She1s like a female Richard Carson whom I think might come in useful ..
2. Presley almost died in a Tupelo, Miss., tornado when he was 15 months old. 5. When he was 10, he sang “Old Shep” during a children’s talent show. He finished fifth. 6. At 11, Presley got a guitar. He really wanted a bicycle (some say a rifle), but his parents couldn’t afford it. 8. The first time Presley recorded, it was for his mother. He paid $4 to Sun Studio to press two songs — “My Happiness” and “That’s When Your Heartaches Begin” — as a gift for her. 9. Presley recorded anywhere from 600 to 1,200 songs, depending on whether the list includes unfinished works, alternate versions, bootlegged recordings, etc. 12. Another Long Island teen is captured in a set of iconic Alfred Wertheimer photos in 1956 — the white-gloved girl got out of a cab with her father in midtown Manhattan, saw Presley there, talked to him and broke down crying when he left. 13. Sometimes, Presley would sign autographs on fans’ breasts — “Elvis” on the left and “Presley” on the right. 14. In 1965, Presley talked about entering a monastery. 15. Presley started wearing a chai necklace because his mother Gladys’ maternal grandmother was Jewish — the reason why he added a Star of David on his mother’s gravestone in the mid-1960s. 20. Presley loved biscuits and gravy, potato cheese soup and meatloaf with mushroom gravy, but he also loved the fat-free, antioxidant-rich, very healthy beefsteak tomato. 22. Presley preferred to take sponge baths, using a rag and soap. 23. As a teenager, Presley worked as an usher at Loew’s State movie theater in Memphis. He was fired when another usher ratted him out for getting free candy from the girl working the concessions stand. 25. Although Presley was honored by his commanding officer for his “cheerfulness and drive and continually outstanding leadership ability,” some Presley insiders felt that his time in the Army tamed him too much. 27. He liked to smoke thin German cigars. 28. While serving in the Army overseas, his one disappointment was never meeting Brigitte Bardot. 29. Presley’s movie idol was Tony Curtis, who had black shiny hair. 32. Presley once used black shoe polish when he did it himself. 34. In between filming 1956’s “Love Me Tender” and 1957’s “Loving You,” Presley had his nose done, his teeth capped and his acne treated. 36. Presley’s romance with Natalie Wood was short-lived, some saying it ended because he was just not that into her (and didn’t like the way she smelled). 38. Some commentators say Presley’s voice spanned three octaves. 39. Presley had a slight stutter. 40. Presley used A&D ointment to keep his lips soft. 42. Later in life, Presley topped the scales at 250 pounds. 44. Presley was said to be as fit as a 21-year-old when he taped the ‘68 Comeback Special. He was actually 33. 50. Presley met the Beatles in 1965, although his manager, Col. Tom Parker, had to force him into having them over to his Bel Air, Calif., house. 55. After receiving a kidnap-assassination threat, Presley performed with a pistol in each of his boots. 56. For his 36th birthday, Presley treated himself to police equipment. 57. In the early 1970s, Presley would impersonate a police officer, driving around with a blue light, long flashlight, a billy club and guns, and pulling people over. Instead of giving out tickets, he would hand drivers autographs. 62. Presley was a “dog” in Chinese astrology. 64. Some believe that Parker had the ability to hypnotize Presley, especially before he’d go on stage. 65. It is believed Presley was prescribed about 10,000 pills the year he died. 66. When Presley played Madison Square Garden in 1972, he rented the New York Hilton’s top floor. 67. Minnie Mae Presley, Elvis’ grandmother, lived at Graceland. 68. Presley had a pet turkey. His name was Bowtie. 69. He also owned a basset hound, two great Danes, a chow chow, a Pomeranian, several horses, some donkeys, some peacocks and guinea hens, ducks, chickens, a chimpanzee, a monkey and a mynah bird. 70. Presley, his parents and grandmother aren’t the only ones buried at Graceland. So is his golden palomino quarter horse, Rising Sun. 71. It’s not clear where Scatter, Presley’s pet chimp, is buried. Some believe the hard-drinking animal died of liver disease; others say he was poisoned by a maid he had bitten. 72. Presley believed he would die in his 40s, like his mother. 73. Presley’s last words were, “OK, I won’t,” when he assured Ginger Alden, his last girlfriend, that he wouldn’t fall asleep reading in the bathroom. 74. It is estimated that there were about 170 Presley impersonators when he died in 1977. Today, some say there are 250,000. Will it continue to be “Silenced” forever in “DEATH” as it was in Life? When will this injustice be corrected? 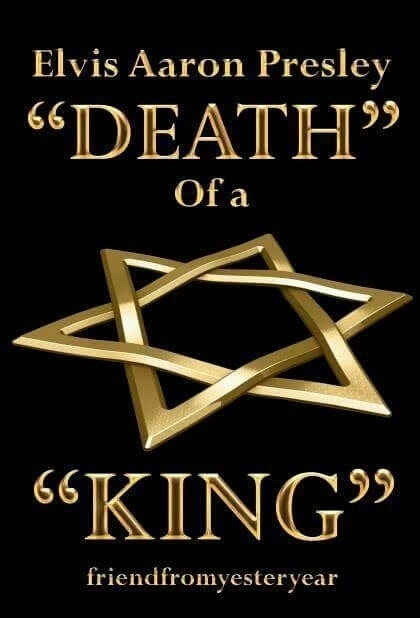 Note the picture of the star of David on the front cover of this book “…Death of a King.” It’s laying down with its 6 points bent out of shape basically seen in a “Distressed Condition”….When will the DISTRESS be removed? Will the injustice to Elvis and his Mother Gladys continue on? The “Historical” record of Elvis undying Love for his Momma must always remain a part of the Story of his life. It was “Part & Parcel” of Who and What He was. 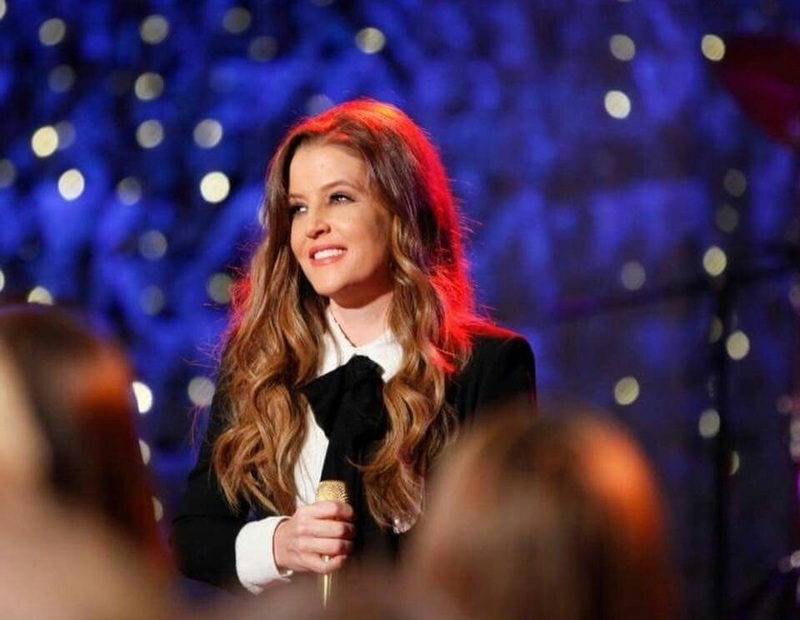 Pass the “Word” on never let it be said “We the Fans didn’t TCB…. “Restore” the last “Gift,” the “STAR OF DAVID,” which Elvis had ENGRAVED on his Momma’s Grave Marker when she passed away on August 14, 1958. This he gave in honor of her Jewish Heritage. It was “IMPORTANT” to him and WE THE FANS FEEL his wishes SHOULD BE RESPECTED. Let the “TRUTH” of “The life of Elvis Aron Presley” be accurately told as the “STAR OF DAVID” which was originally on his Mother’s Grave Marker at “Forest Hills Cemetery” is restored to its proper place alongside the Christian Cross that adorns Gladys’ Grave Marker at Graceland’s Meditation Gardens,” Memphis Tennessee USA.,This was his last gift before he left the public. This stone is at Graceland in the garage. Vernon was later found to be "Anti-Semitic" According to Marty Lacker. Vernon didn't like Jews. So he chose not to honor his son's request which was to have on his Mother's Grave Marker," The Star of David" engraved. Vernon chose to do it his way....so NO "Star of David at Gladys Grave Marker to this very day....If you notice ion this photo you will see the "Christian Display with the Statue of Jesus. Gladys was buried under that Large Statue of Jesus, a large cross and lastly 2 Large angels. 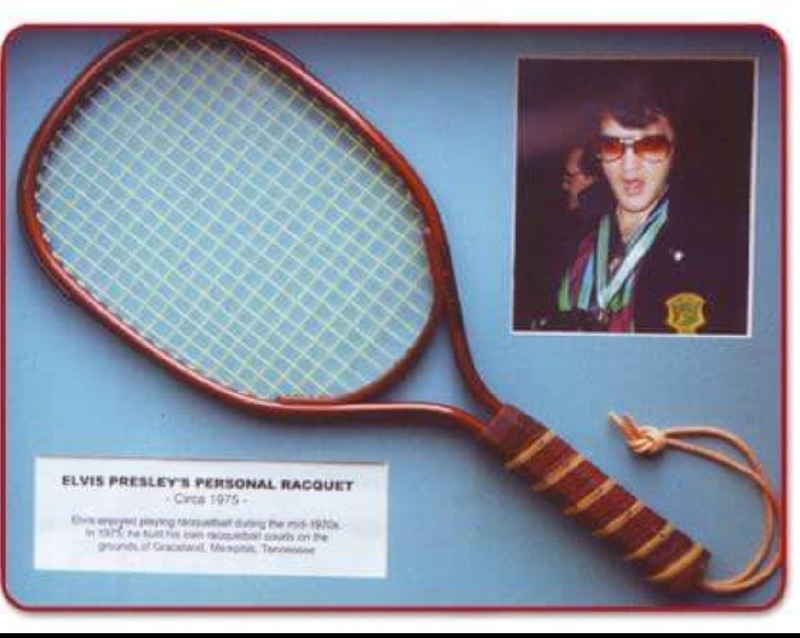 If you look closely you will see the "Gift" Elvis gave to his Momma. It's a small Grave Marker with The Star of David and a Christian Cross also engraved on it, you see it just a few feet forward of the Christian display. All this was seen at Forest Hills Cemetery in Memphis Tennessee USA on 8/14/1958 YOU'LL NOT SEE ELVIS "Gift to his Momma" "The Star of David" engraved on His Marker for Her in Honor of Her Secretly held Jewish Heritage AT GRACELAND MEMORIAL GARDENS.. All due to Anti-Semetism" during their entire lives. Do you have a favorite record or favorite movie of your father’s? I love the ’70s era of music, mostly because I was there for that. And as far as the movies go, I’m very partial to “Love Me Tender” and “Jailhouse Rock.” I love those. I enjoy them all, but those are the ones I sort of feel he was really able to show his acting the way he wanted to at that time. I know those were kind of his favorites, too, for the same reasons, so I kind of feel the same way. Documents that are apart of FBI files paint a picture of Elvis Presley that the public eye has previously been blind to. These same documents clearly show that Elvis was embroiled in a life and death situation before his tragic death. There is also reliable information to suggest that he was still alive at least 4 years after he was medically and legally certified dead! Frederick Pro was in reality, a con man. He belonged to a group known as The Paternity. They were closely linked to organised crime. By the spring of the following year, the Presley estate had lost more than a million dollars (see the "Contract" between Frederick Peter Pro and Elvis Aron Presley below). Before Elvis Presley wanted to sing, he wanted to be in law enforcement. By 1970, he had received many honorary and real law enforcement credentials. He was convinced that he had unique services that he could offer his country. In December that year, he flew to Washington DC. During the flight, Elvis wrote a letter to President Nixon. In the letter, he introduced himself and expressed his desire to be of any service to his country. After much deliberation, it was decided by the president's office, that President Nixon will meet with Elvis Presley. 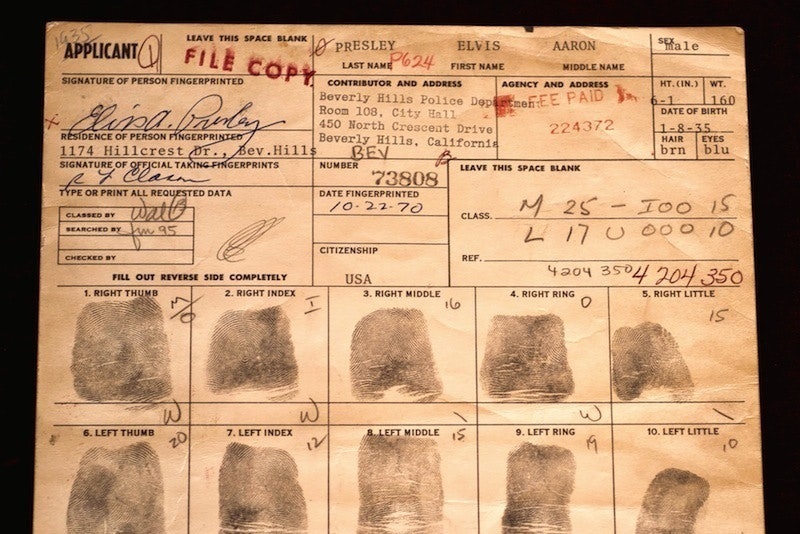 Elvis was awarded the credentials that would make him a federal agent. He allowed, in turn, an agent to secretly be apart of his road crew from 1974 to 1976. What that agent investigated, no body will say. Around the same time, Elvis began to show interest in spiritual and religious enlightenment. Despite being so widely recognised, he was able to keep this part of his personality a secret. The spiritual side was a secret by his own choice. His undercover alias, he kept a secret because he was duty bound. His alliance with the government, the death threats and the fact that he allowed an agent to travel as part of his band, had created a conception amongst thousands of people that he might be part of the Witness Protect Program. In March 1977, a full 3 months before Elvis died, he cashed in 3 life insurance policies, the total value being 2 million dollars. Shortly after his death, a private cheque account, with an excess of a million dollars had slipped of the grid. This has yet to be explained by anyone in the Elvis Presley Estate. There is still a fourth remaining policy for Elvis that is yet to be claimed, despite his death all those years ago. Could this be so in order to avoid insurance fraud because Elvis is still alive. Various samples of Elvis's handwriting has emerged since his untimely death. On FBI documents, handwriting detailing a number of corrections have been closely matched, by several independent specialists to be his handwriting. How can this be if Elvis was already dead at the time these documents were released. Handwriting specialists also speculate that Elvis himself, filled in details on his death certificate. Elvis had gotten severely embroiled in Mafia activities somewhere along the line. After a hit was ordered on him, President Nixon recommended he go into the Witness Protection Program. Elvis, however, was not convinced that his father and daughter would be safe. That was what stirred his brain to hatch a more secure plan. It was then decided that Elvis would have to die. IS ELVIS ON FACEBOOK TODAY? Ok I Believe This person here on facebook really may be Elvis . This person has now went through many accounts because of fans who can not believe in the possibility that they really may be Elvis . These same people get sacred and report this person to Facebook as a fraud . These people do this with out even given this person a chance to prove if they are Elvis or not .There is no proof that it is Elvis . But there is no proof that it is not Elvis .How is it going to hurt anybody to give this person a chance to prove if they are or if they are not .. The false rumour online is that Jesse Garon Presley never died at birth but was adopted because Vernon and Gladys were too poor to keep two babies. Certificate of death (opposite ) disproves this entirely.
" .......... Vernon thought that this would be a good chance to locate Jesse's body, and bring it home as well, thus making sure that the family was properly together again. 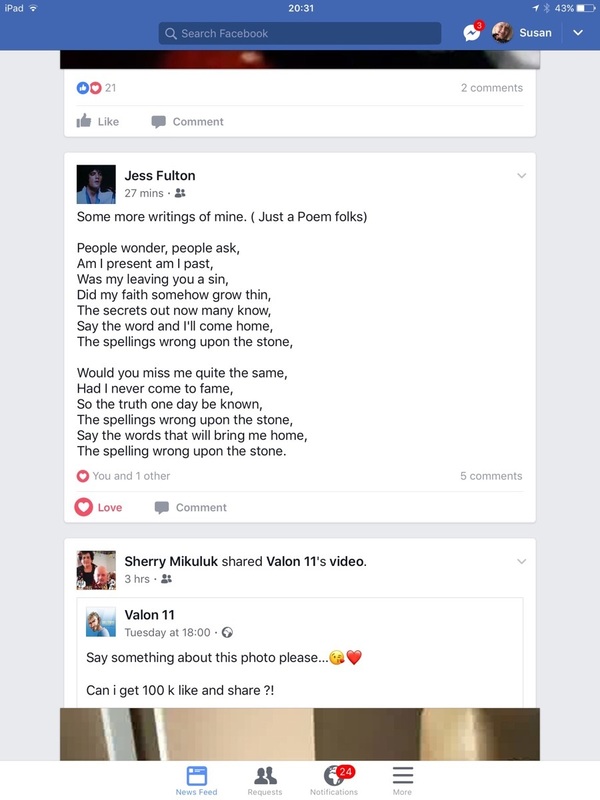 Sometime, I believe it was about the middle of September, Vernon, along with several family members, made two different trips to Priceville Cemetary in Tupelo, in an attempt to locate Jesse's grave. He had hired the services of a funeral home to relocate Jesse's body to Graceland, along with the rest of the family, if he were able to find the grave. Sadly, however, the ravages of time and the environment had swept away any remaining clues as to the location of the original grave. It was never located, and Vernon, with a heavy heart,....... on the night of his second failed trip to Tupelo ....... announced ........ that they would have to settle on a memorial plaque, instead, to honor the memory of his second son. I did see the tears in his eyes that night." - Nancy Rooks from "Inside Graceland." Would Vernon have went to the trouble of trying to locate Jesse`s grave twice if he knew he was still alive somewhere?? When everyone had finished viewing Elvis in the house, Nancy Rooks (Elvis' cook) and Al Strada went to pay their respects. As to what Elvis looked like Nancy said "I can only say that he did not look like the Evis I had known." She goes on further to say "His face and body both looked somewhat thinner, and I immediately noticed that he looked different in some way." 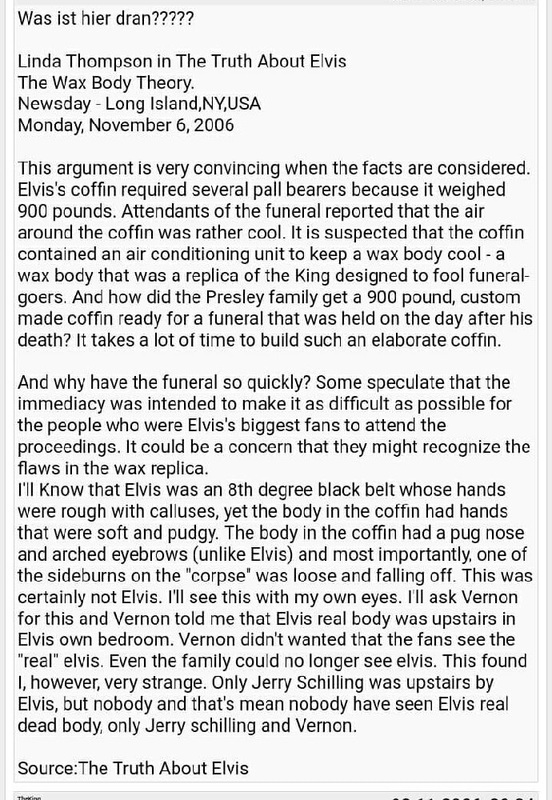 So even Nancy says that the man in the casket doesn't look like Elvis (confirming that it was not Elvis in the casket)!! Then Nancy says "Then it dawned on me what that difference was. He was dressed in a coat and tie, something I was not used to seeing him in." This confirms the comment I made that Elvis did not like to wear a tie (so in many pictures Elvis is seen not wearing a tie). "I was left standing in front of Elvis, alone in my thoughts I have been asked many times what he looked like, and what my thoughts were at that moment. I'm not sure that I can do justice to either one of those questions. As to what he looked like, I can only say that he did not look like the Elvis I had known. I want to say that he looked at peace, but I'm not sure that is what I saw, or what I WANTED to see. I had seen him fighting so many battles with various ailments and illnesses in the last few years and I wanted to know that he was now ok.
His face and body both looked somewhat thinner, and I immediately noticed that he looked different in some way. Then it dawned on me what that difference was. He was dressed in a coat and tie, something I was not used to seeing him in. it was a far cry from the casual clothes he was usually wearing when I would see him while he was alive." 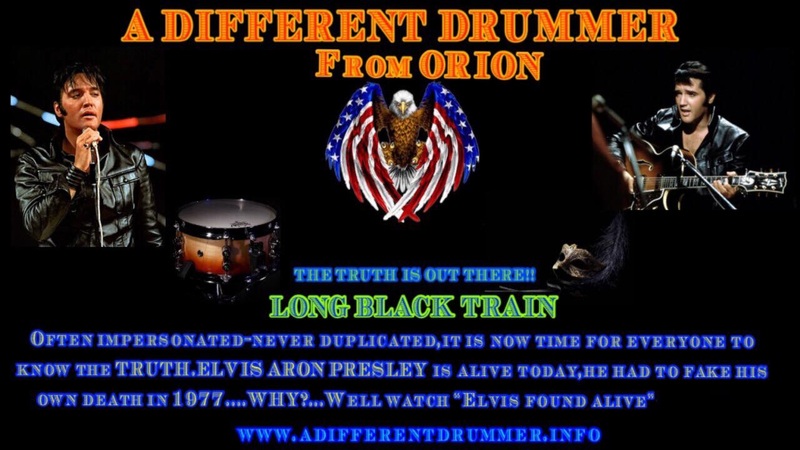 the "Mystery" of the Newly found 3rd Birth Certificate which opens up a new portion of the life and times of Elvis Aaron Presley...History is now changed to more accurately reflect the "Man"..a "King" among many. It now hangs in Elvis Memphis at Graceland...December 28, 1953 (The date Elvis himself changed the spelling of his middle name to Aaron. Why? Why on that specific date?He had a reason. This was kept secret between his mother Gladys and Himself all their lives. No one including George Klein knew about it....but "friend" understood and waited. The time has arrived. Read Elvis Aaron Presley "DEATH"of a "KING" for answers that will be viewed by his fans as Apocalyptic! Who do you think friend from yesteryear is ? ELVIS WANTED TO TOUR AUSTRALIA BUT HIS MANAGER COLONEL PARKER WOULDN'T LET HIM!! Elvis Presley wanted to tour Australia but his manager Colonel Tom Parker wouldn’t let him. overseas. He wanted to go to Australia. He wanted to go to Japan. The Colonel said, “if you go I am not going to go with you”. Elvis said “that’s fine, you are fired”,” Jerry tells Noise11.com. Colonel Tom was a powerful person in the music industry back then and even Elvis couldn’t beat him. “When Elvis tried to get a tour going no-one would touch him because they were afraid of the Colonel,” Jerry said. “They had the relationship with the Colonel. They respected the Colonel. They did not want to go behind his back. The bottom line Elvis could not stretch the way he wanted to because of the confines of the business”. Colonel Tom made Elvis a star but after a decade Elvis was growing tied of him. “I think creatively Elvis outgrew the Colonel and that’s what caused a major conflict,” he says. “Musically and acting wise Elvis didn’t want to do at 30 or 35 what he was doing at 19 and 20 (nor would anybody else). I lived and worked with Elvis and I was with Colonel Parker one day a week. As a young guy I learned a lot about the relationship between and artist and a manager. The manager must understand the creative needs of his artist. He doesn’t have to bring him ‘Sgt Pepper’. That is for the artist to develop and for him to get it done. The artist must understand what the manager needs to do to promote their artistic work. They need to understand each other’s role to make the whole thing successful”. Schilling says that despite his faults, the Colonel was a genius. “Colonel Parker is the most misunderstood person in the music industry,” he says. “He was brilliant in a simple way. He could outsmart any mogul or film company owner. Don’t ever say Colonel Parker wasn’t a brilliant guy. Creativity was not his best quality. He was the go-to bad guy. Colonel Parker was an honest guy. I used to dread going to work for him but at the end of the day it was pretty damn interesting. I became very close to him. I was the closest person to him in the last 20 years of his life”. Jerry Schilling was in Australia earlier this year for Q&A’s about Elvis. Alan Barbera owns Kingtinuing records. 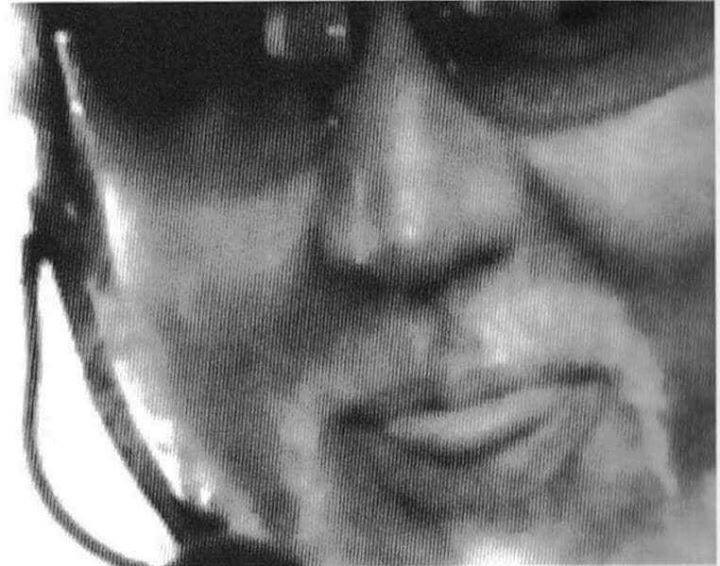 The pic used by RON JESSE on his contract . 76 years old. This is the 2004 photo sent to deveral radio stations with a copy of the song STARS AND STRIPES . Hoping for a comeback , this was a failed attempt .